MackieMade Paper Creations: It's 5 o'clock somewhere! 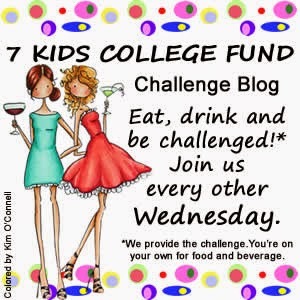 "Anything Goes Challenge" here at 7Kids! Or are you needing a drink about now???? HaHa! I just love this stamp by StampingBella! She is called Madison has a Margarita. Isn't she precious! I wanted her to be bright and festive. Miss Madison is stamped on watercolor paper with Black Tuxedo Memento ink. And I colored her with Copic Markers. I added some Glossy Accents to her cocktail and her shoes. And I colored her dress with a clear Wink of Stella glitter pen. It is hard to see this in he photo, but looks really cool IRL!! After I colored her, I lightly brushed the background with water around the image. Then I added some Ranger Distress inks to get this cool watercolor effect. I stamped some stars and added some sequins for a little oomph! Now, go check out what the other design team members are doing! And you can join our challenge here!!! Love this image, colored perfectly and I love the background! Squeal this is so CUTE Mackie!! She's full of sass and I love her striped stockings with her fashionista boots!! VERY FUN! WOW! I just absolutely LOVE this card! It is so fun and funky!! !Her dress is in gorgeous color and wonderful watercolor background! What a gem this card is...love it!!! SO cute~~ I love your watercoloring and that girl is so fun!! What a fun and sassy card MAckie. Love the coloring, and oh, that background... fantastic! LOVE your watercolored BG and that girl looks like one of my friends! CUTE card! THAT'S our motto now that we're retired! LOL!